For Zoup's co-owners Richard Simtob and Eric Ersher, costs associated with health care reform are a top concern. 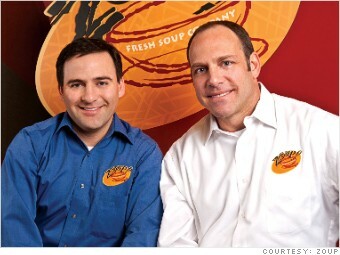 Richard Simtob, co-owner of specialty soups franchise Zoup, said he wasn't in a good mood after President Obama was re-elected. His biggest concern: health care reform. He fears it could put a crimp in the company's hiring plans. Starting in 2014, small businesses with 50 or more full-time employees will have to provide health care insurance or pay fines. Zoup's four company-owned stores haven't hit 50 workers yet. When that happens, Simtob said he'll cut hours for the full-time workers to avoid the penalty. "I have to do this if I want to stay in business" said Simtob. Taxes are top of mind for him, too. "If my taxes go up, it means less money for me to invest in growing the business," he said. Still, Simtob is hopeful that, under Obama, existing credit programs such as the Small Business Administration's 7(a) loans for franchisees, will continue. "On their own, banks are very afraid to loan money to a franchisee," said Simtob. "We depend on these government-based loans to help franchisees get access to bank loans so that they can buy and run our Zoup restaurants."